I have to admit that the last walk, which ended at Two Tree Island, had been a bit bleak. It was overcast, and the tide was out, exposing the great piles of silt which constitute the Leigh Creek mudflats. Boats sat uneasily, waiting for the tide to come in and cover their dirty bottoms! The wind was chill and the air had a dankness to it. We did not come away with a great impression of Two Tree Island that day. As a result, I was expecting more of the same today. However, the weather was crisp and clear, the skies were blue, and it was unseasonably warm – perhaps even unreasonably warm – despite the blustery wind. As we walked the tide came in, and the unappealing mudflats were covered with glorious water; bright, yet deep blue in colour. The area today looked healthy whereas before it had looked drained of vitality. We may have only added three miles to our trek around the coast of Britain today, but what a three miles it was (actually it was closer to seven, because we turned round and walked back again). I speculate, but perhaps they were here for the Battle of Benfleet. This took place in 892 AD (some say 896 AD), when Edward, the son of King Alfred, left London and attacked the Viking settlement at Benfleet. He stormed the fort and set fire to the houses and ships. The vikings retreated back to Shoebury. After parking at Two Tree Island, we crossed the bridge back to the mainland and took the footpath west along the coast. Good views towards the ruins of Hadleigh Castle were had throughout the walk, slowly revealing a large hole in one side that we only realised was there as we edged westward. 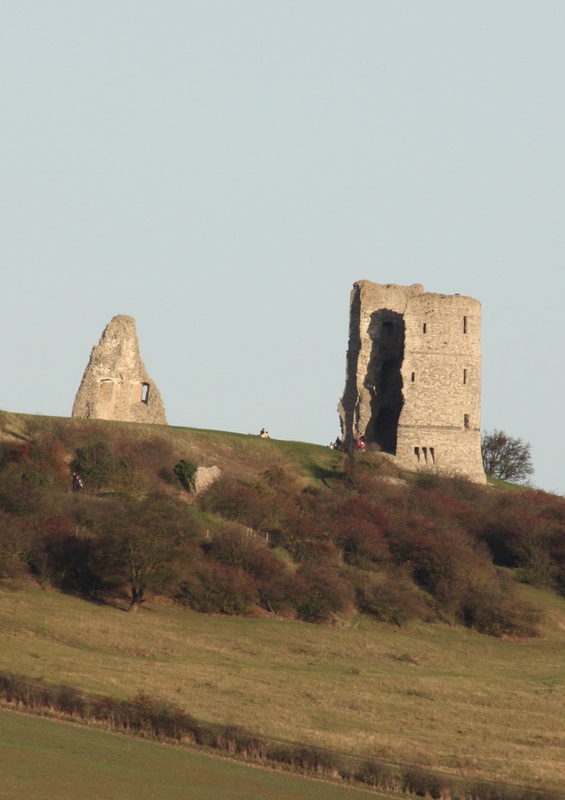 This part of the coast is quiet, and although there is an abundance of wildlife and natural beauty to it, there is little man-made activity, apart from the long-abandoned castle and apart from the railway line that runs to Benfleet. Even the trains shoot straight by, however, and do not stop at Hadleigh. The reason for this lies with William Booth, the first General of the Salvation Army. Booth bought most of the land between Leigh-on-Sea and Benfleet in 1890, and created the Home Farm Colony. Here he trained “criminals, the pauper, the reckless and helpless” in various skills, generally before they were sent overseas. When the railway came in 1911, the Salvation Army refused to have a station built on their land. This is why there are frequent stops between Southend and Leigh, but then a three mile stretch between Leigh and Benfleet with no station. The coastal path between Leigh and Benfleet is a causeway, raised from the surrounding terrain, and situated between Benfleet Creek to the south and Hadleigh Marsh to the north. In good weather it is a beautiful track to walk. The only visible sign of the Salvation Army today is “General Booth’s Jetty”. This is not a jetty at all, but rather the remnants of it. The boards are long gone and only the posts remain. Indeed, although the land around here is still owned by the Salvation Army, you would not know it to look at. Whilst a farm still remains, the Home Farm Colony itself declined after the First World War and no longer exists. A Cormorant perched on one of the jetty’s posts, the only user of the jetty today. As we continued on our walk, birds wheeled overhead. 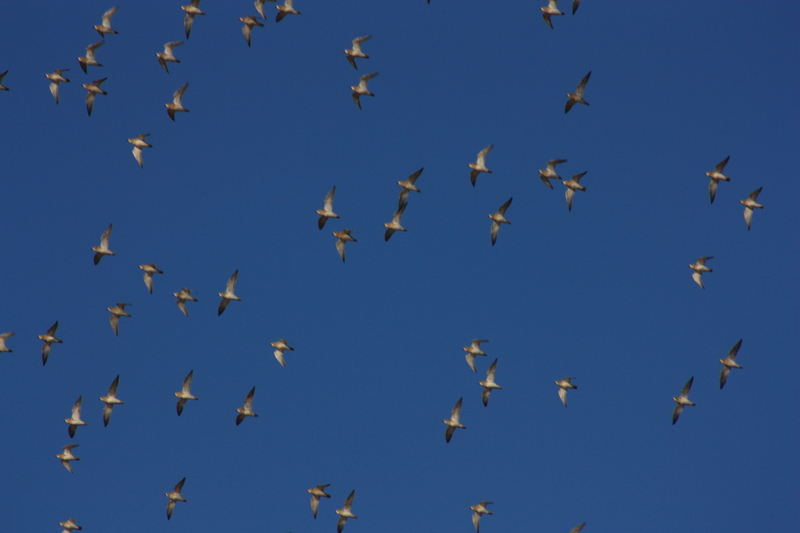 They were not starlings, but their group movement was starling-like. It was beautiful to observe, and for several minutes we stood and watched. In the meantime, the tide raced in. Before we knew it, the mudflats had been transformed into a creek, with small boats racing up, taking advantage of the combined effects of wind and tide. The gusty wind presented a challenge, and one couple had to react in a split second as the wind nearly took their vessel and threw them into the sea. As they leant over one side, their boat pitched violently to the other, and it looked as if it would continue right over and capsize. The two passengers sat bolt upright in horror (the worst thing they could have done, as it added further ballast to the wind’s advantage), but the wind let them off and tipped them gently back their way. They tacked round and headed hastily back the way they had come! 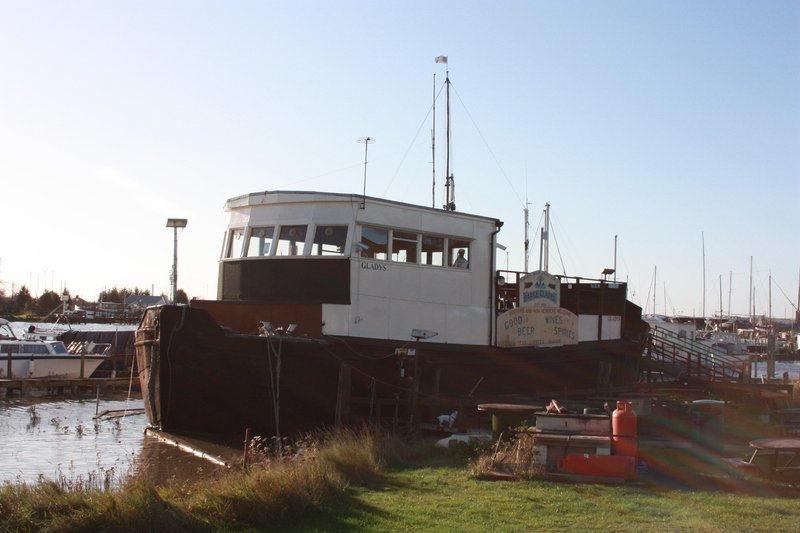 Eventually, after a thoroughly pleasant walk, we reached the moorings at South Benfleet. The footpath goes right through the private moorings, and here we stopped off at “Gladys”, a barge which has been converted to a pub. We stopped here for a quick drink. Beyond the moorings is Canvey Road, and here the fourth stage of our walk came to an end. 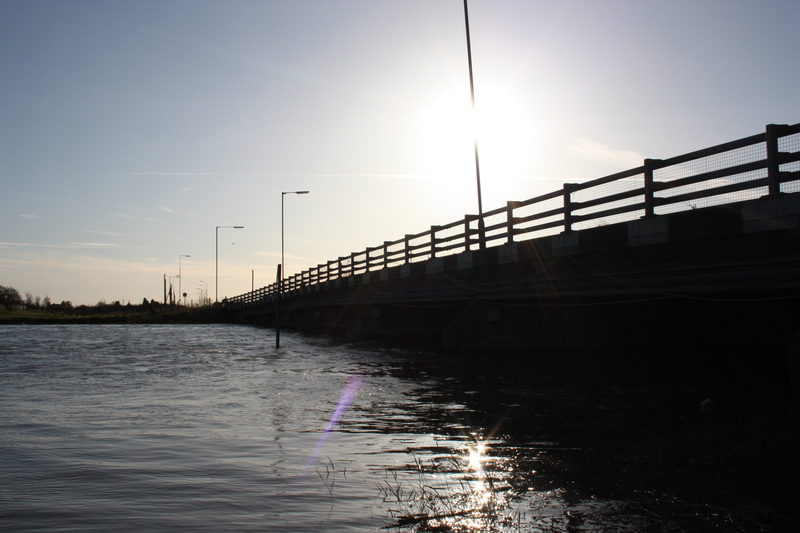 Just before Canvey Road is the Benfleet Barrier, a flood barrier with three spans of 39 foot each, and with a central gate nearly 20 foot tall. 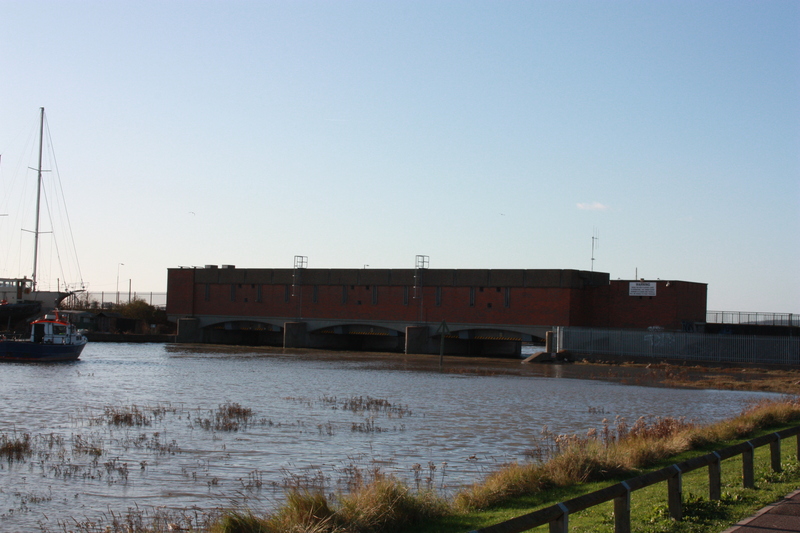 Built as a by-product of the Thames Barrier and Flood Protection Act 1972, the Benfleet barrier’s true origins really lie in terrible floods that occurred in this region in 1953, and of which I will speak more in the next blog, when we trek round Canvey Island. As it was, we looked at the bridge from the mainland to Canvey Island. We decided not to cross this today, but would wait until the next walk. 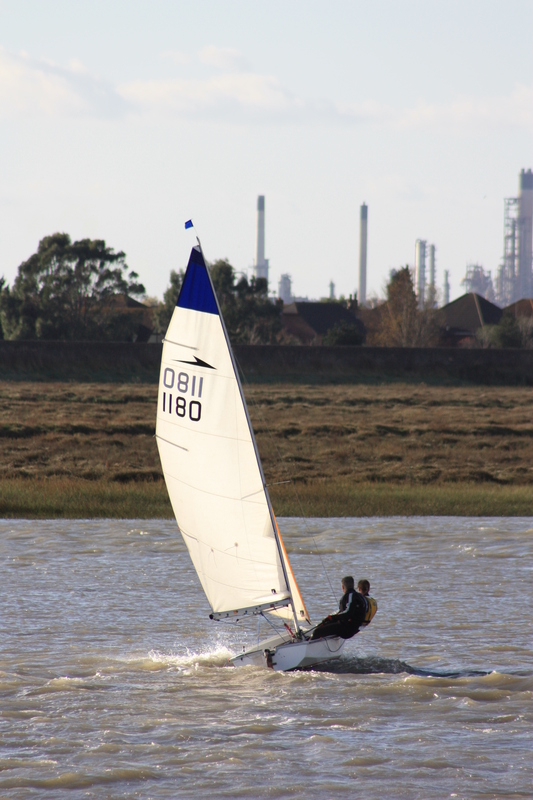 This entry was posted in Essex and tagged Benfleet, coast, Essex, travel, Two Tree Island, walking. Bookmark the permalink. I love the history you give about the areas you’ve walked – you make it all extra interesting! The picture you have labeled as the Causeway… is that the active railroad track or is it one not used anymore? In “The Essex Coastline – Then and Now” there are tramlines mentioned, running from the kilnworks to General Booth’s Jetty. There were two set, but these ran north-south, whereas what I describe as the causeway runs east-west. The book also says the tramlines were pulled up and their route is hard to trace today (although parts of a red brick bridge remain – I think we saw these as we walked by). The book describes the route we took as a sea wall, so it is raised to provide protection from the sea.